NEW SEPTEMBER 2017. 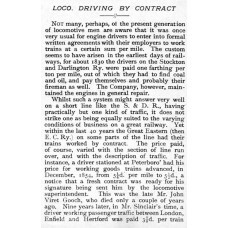 Locomotive driving by contract, as practiced on parts of the Eastern Counties Railway, entailed paying a driver a fixed price per mile. Out of this he had to find the money for such things as his coke (as it then was) and oil, and for an assisting engine up a bank if he should need it. 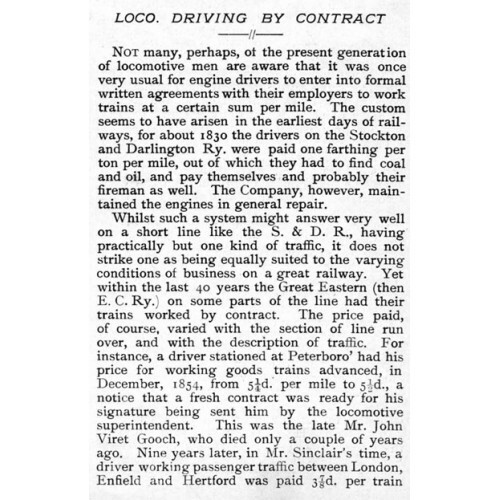 This system was described in the Locomotive Magazine of 1903. It was followed by three short articles of early railway reminiscences relating to the ECR, with a glance at happenings on the LTSR as well. Naturally drivers were very keen to use as little fuel as possible, and these articles give anecdotes of dodges they got up to in order to achieve that. These scans show the instructions issued to the Locomotive Superintendent at Cambridge, signed perso..
MN005 ECR Locomotive and Engineering Committee, etc. The Locomotive and Engineering Committee July 1849 to October 1850, and the Traffic, Locomotive and ..
NEW SEPTEMBER 2014. The Eastern Counties Railway Rules and Regulations, dated 12 September 1854.&nbs..
NEW OCTOBER 2015. This is a major new publication. The information in it is the result of extensive ..
NEW OCTOBER 2017. This file contains articles of GER interest taken from the pages of the Loco..
NEW MAY 2018. This is a pocket-sized 32-page booklet entitled 'Good Firemanship'. It has card covers..